Keeping your workforce happy, healthy and at work. Empower your employees to deal with their issues before they become problems. Deal with rising stress or sickness levels, high staff turnover or a breakdown in workplace relations. The atmosphere in your workplace may not be conducive to efficiency and effectiveness, or your staff could be facing redundancies. You may have been supporting staff in-house but this can take up valuable time and cause conflicts of interest. Our first-class, confidential, direct-access counselling service enhances the motivation, effectiveness and wellbeing of employees. 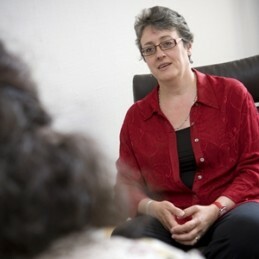 Oasis Peoplecare has been providing counselling services to organisations from a variety of sectors for over 20 years. We work with third sector organisations, membership associations, housing associations, schools, social enterprises, and commercial companies across the UK. The service is highly regarded by clients, who frequently recommend us to their colleagues and networks. Sessions are arranged through a free-phone referral number or by email and take place face-to-face. Our staff support services are proactive and preventative rather than crisis-driven. Counselling can help with issues which have an impact on work performance, such as anxiety, stress, bullying or bereavement. It helps people keep on working and find ways to manage their situation, reducing feelings of isolation. They say they value the opportunity to talk and be listened to. The way conflict is managed reflects the health of the organisation and the people who work within it. Our Seven Stage Model of Effective Relationships is the robust framework at the centre of the blended approach to conflict resolution and mediation that we have created. We offer mediation, conflict coaching and assertiveness training, whether the conflict is between teams, within teams or between individuals. We provide a bespoke service according to your needs. We offer proactive, responsive or pay as you go services, with clear fee structures based on your requirements and the sector you work in. Our proactive service empowers and encourages staff to deal with issues before they become problems. Employees have direct access to our free telephone referral line to arrange counselling with one of our experienced practitioners, matched to their needs and location. The referral line is open 9am-8pm Monday to Friday, with a 24-hour answerphone. Employees can also contact us directly by email to arrange counselling. This service includes bespoke promotional materials, valuable feedback on issues and trends, reports and administration. Our responsive service allows you to keep control of referrals. Your HR team can act as a gatekeeper to filter and refer those who are most in need. At review meetings you will get feedback on trends and issues that may impact on performance and wellbeing. Our pay as you go service is suitable for smaller organisations that want to have counselling provision in place as a safety net, or to use for a trial period to gauge levels of usage and see the benefits. We provide a flexible service, offering a choice of quality counsellors and face-to-face counselling outside work hours if necessary. Our confidential telephone referral system and independent external counsellors allow employees to access support without worrying about potential conflicts of interest or the effect on career progression. A body of evidence indicates that counselling works, ranging from findings from the Health and Safety Executive (HSE) to anecdotal evidence gathered from organisations Oasis works with. We provide feedback on issues and trends, advising where change may be needed and how we can help. All counselling practitioners who work with Oasis hold a diploma in counselling/human relations, have a minimum of 200 hours of supervised counselling practice, professional liability insurance and undertake regular supervision. Our practitioners’ approach to counselling derives from the Seven Stage Model which follows from our peer-based approach to learning and development. The counsellor’s aim is to facilitate the client’s learning; they are not experts in other people’s lives. We have been very grateful the service has been there and the counsellors have gone out of their way to be very helpful to the clients. To find out more about how we can support you and your organisation contact Lise Ribeiro on 01937 541700 or use the contact form.